It was the same engine had to look it up on the net didn't have my phone out it was a shock to see that engine in the middle of two NS going engines. Think that is a UP engine. Think I saw that one in Columbus a few weeks ago behind a CSX power. Darn didn't know you were going up there today. If I knew that you could have brought me something back. There is a shop up there this guy holding something for me. Oh well I will be up there in April. Chesterton is a great place to catch train action. You never know what will run up there. Last year I saw a military train and an hour later one with a bunch of Target signs which was pretty cool. 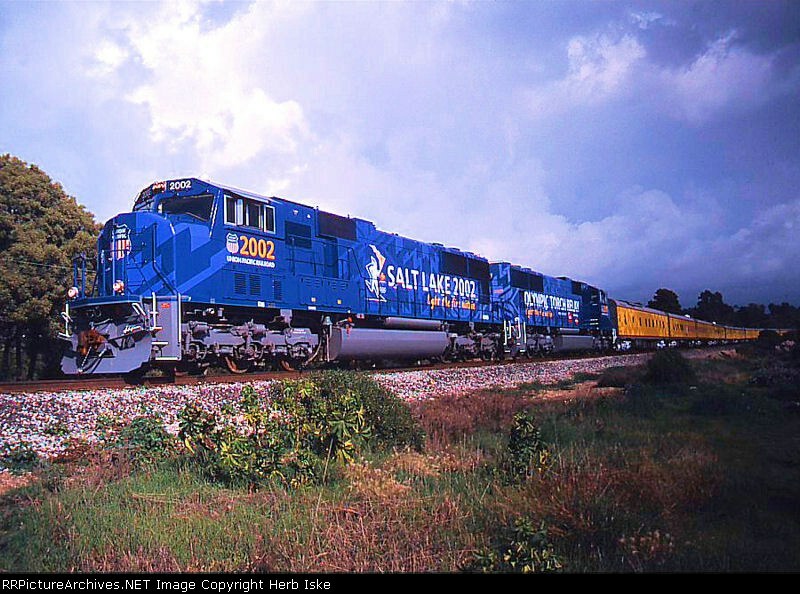 Yep UP SD70M #2001 and 2002 There are two of them. They are in a matched scheme for the Salt Lake 2002 Olympics. 17 year old paint scheme. I saw them together in Rochelle IL back in 2009. last fall I was seeing pictures from out west where the pair had been broken up. Not sure if one was in for some sort of mechanicla issue or what. Good to see them back together. Let's hope UP does not repaint them anytime soon. Great looking scheme. Haven't seen those in a while. Good to see it again. I was too busy watching Ashland, so I didn't see it. Darn it! Why do trains go through crossings AFTER i'm through them? Once in a while, someone at the UP power desk makes an effort to put them back together. They eventually get broken up and the process repeats. UP repainted those units within the last two years. I had been told UP redid them after commenting how nice they looked for being so old. They are part of the "heritage fleet" so they will likely remain in that scheme. Currently all of the heritage units and the special paint units fit this category.